I’ve been reorganising my desktop (the physical one, not the virtual one) recently. So I’ve not got a MacMini (main workhorse) with dual video outputs to two screens, and my Linux test server (called “The Borg” because it’s in a clear ATX case with lots of internal lighting) which is also running two screens. But this meant two keyboards, and two mice. And I was constantly picking up the wrong mouse/keyboard. For the MacMini I use an Apple Bluetooth mouse and keyboard, and wanted to use this for both computers. I do have a 4-port KVM switch, but that would just add more clutter to the desk. So I decided to look into software to run multiple computers from one mouse and keyboard. I did take a bit of work to configure correctly, but now I move my mouse to any of the four screens (two Mac and two Linux) and type right there – just awesome! 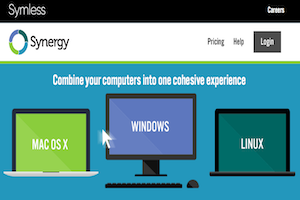 One of the reason I chose Synergy is that it has clients for Mac, Linux, and Windows. Although I don’t use anything Windows I’m sure many of you do. There are even builds specifically for Ubuntu, Debian, Fedora and Red Hat.